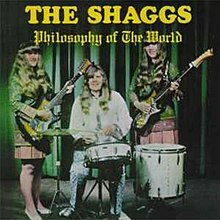 Philosophy of the World is the only studio album by the all-female teen rock group The Shaggs, released in 1969. The band was composed of three real-life sisters, Helen, Betty, and Dorothy (or "Dot") Wiggin, from Fremont, New Hampshire, USA. They were managed by their father, Austin Wiggin, Jr., and were sometimes accompanied by another sister, Rachel. They performed almost exclusively at the Fremont town hall and at a local nursing home, beginning in 1968 and ending in 1973. Although most people in Fremont disregarded the band's sound, their father still believed his girls were going to be stars, and in 1969 he took most of his savings and paid to record an album of their music. Austin drove the girls down to a studio in Massachusetts, determined to get them on tape "while they were still hot." Striking a deal with a local fly-by-night record company called Third World Recordings, they recorded their debut album in one day, recording a dozen tunes all written by Dot. Upon the first original pressing, 900 of the original 1,000 copies of the album vanished out of the warehouse, and shortly thereafter the record company's producer/president also vanished and the label quickly folded. Despite the setback, music collectors quickly got a hold of the remaining copies and word of mouth started, with those who liked it giving almost universal praise, but with many others complaining of the sloppy, almost nonsensical way the arrangements were made as well as the singing. Some claimed this was done intentionally at the urging of their father (a rumor that persisted for many years, although he denied it, and the notion would further be disputed when the tracks from the band's 1975 recording session, which showed much more polished and professional-sounding musicianship, resurfaced in 1982). By the mid-seventies WBCN, a local radio station in Boston, Massachusetts, began playing a few cuts from the record, and their popularity was renewed. It was further renewed in 1978 when famed independent music band NRBQ listened in, sought out a copy, then had it re-released in 1980 on the Red Rooster Records/Rounder Records label. Later, Dr. Demento, an American radio broadcaster and record collector specializing in novelty songs, comedy, and strange or unusual recordings, began to play the album almost exclusively on his radio show nationwide, especially around the holiday Halloween when he would play the album track "It's Halloween", and for many years since it became part of his top "Funny Five" recordings of the week. Later a CD version of the album, which also contained their follow-up album Shaggs' Own Thing was released in 1988 by Rounder, and another CD of just the original first album was released by RCA Victor in 1999. Light In The Attic Records reissued the album on vinyl, and in September 2016 issued a 180g three-color vinyl edition, which was limited to 500 copies, and included a booklet with rare photos and an extensive background essay on the history of the band and the recording of the album. "Philosophy of the World is the sickest, most stunningly awful wonderful record I've heard in ages: the perfect mental purgative for doldrums of any kind," wrote Debra Rae Cohen for Rolling Stone in a review of the 1980 reissue. "Like a lobotomized Trapp Family Singers, the Shaggs warble earnest greeting-card lyrics (...) in happy, hapless quasi-unison along ostensible lines of melody while strumming their tinny guitars like someone worrying a zipper. The drummer pounds gamely to the call of a different muse, as if she had to guess which song they were playing - and missed every time." "Without exaggeration," Chris Connelly wrote in a later Rolling Stone article, "it may stand as the worst album ever recorded." In an article for The New Yorker, the album was described as "hauntingly bad". Nirvana frontman Kurt Cobain listed Philosophy of the World as his fifth favorite album of all time. The record has also been cited as highly influential by Frank Zappa, Kimya Dawson of The Moldy Peaches, and Deerhoof. The album is ranked number 100 in Blender (magazine)'s 100 Greatest Indie-Rock Albums Ever . In 2010, it was included in NME's "The 100 Greatest Albums You've Never Heard" list..
All songs written and arranged by Dorothy Wiggin. Rachel Wiggin: bass guitar on "That Little Sports Car"
^ a b Venus Zine article: "Venus Zine Classic: The Shaggs Archived 2011-05-23 at the Wayback Machine". ^ "Reviews for Philosophy of the World by The Shaggs". Metacritic. Retrieved 8 March 2019. ^ Koda, Cub. "Philosophy of the World – The Shaggs". AllMusic. Retrieved 8 March 2019. ^ Bangs, Lester. "Better Than the Beatles (and DNA, Too)". The Village Voice. Retrieved 8 March 2019. ^ Lane, Mike. "The Shaggs - Philosophy Of The World". Mojo. Retrieved 4 June 2008. ^ Moreland, Quinn. "The Shaggs - Philosophy of the World". Pitchfork. Retrieved 14 October 2016. ^ Paul, John. "The Shaggs: Philosophy of the World". PopMatters. Retrieved 3 October 2016. ^ foist, d. "THE SHAGGS - PHILOSOPHY OF THE WORLD". Record Collector. Retrieved 1 November 2016. ^ Cohen, Debra Rae (October 30, 1980). "Philosophy of the World". Rolling Stone. Straight Arrow Publishers, Inc. (329): 56. ^ Connelly, Chris (December 11, 1980). "Is Rock Ready for the Shaggs?". Rolling Stone. Straight Arrow Publishers, Inc. (332): 19. ^ "Kurt Cobain Top 50 - 05 - The Shaggs - Philosophy Of The World video". NME. 2008-10-16. Retrieved 2012-03-23. ^ "Blender's 100 Greatest Indie-Rock Albums Ever". Retrieved July 22, 2018. ^ "The 100 Greatest Albums You've Never Heard". NME. Retrieved 11 October 2018. Chusid, Irwin. Songs in the Key of Z. This page was last edited on 12 April 2019, at 12:06 (UTC).